Home » Gadgets & Apps » Is the Astro Virtual 2 just a rebranded version of the Chinese iNew V3? Is the Astro Virtual 2 just a rebranded version of the Chinese iNew V3? 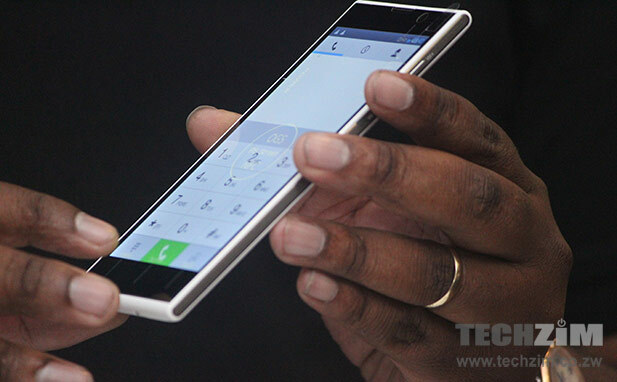 On Wednesday 14 May 2014, Astro launched their new flagship smartphone called the Astro Virtual 2. After the launch, I suspect a lot of people left the venue feeling a sense of pride towards what Astro is doing. After all, the device that they presented is sleek and does look world class. But is the Astro Virtual 2 really what Astro wants us to believe? Following a tip off from one of our readers, we have since established that the Astro Virtual 2 is the exact replica of the iNew V3, a smartphone supposedly developed in China by a company called Shenzhen Chuangxinqi Communication Co., LTD. All indications are that the iNew V3 was released in 2013 and there are already countless reviews of the device online – most of which are positive reviews. The iNew V3 ranges between $150-$200 depending on the market. But what are the exact similarities between the Astro Virtual 2 and the iNew V3? 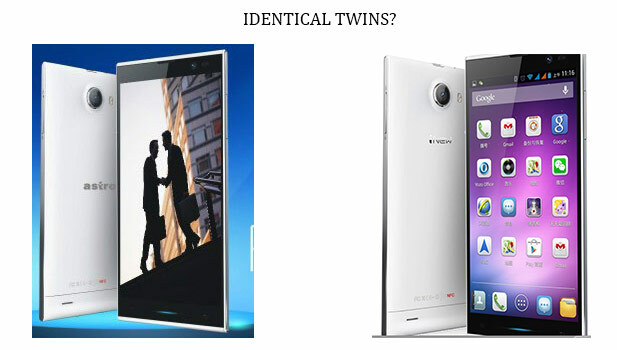 Firstly, there is no question about about the design similarities. The shape, the size, thickness are exactly like for likes. Astro say their Astro Virtual 2 weighs 120g but the iNew V3 is 128 g, which is the only (negligible) difference with regards to size. The specs are almost like for like as well. The Quad-core processor, 16 GB storage, 1 GB RAM, HD 5″ Gorilla Screen (Astro says theirs is Full HD), etc. The table below has a full head to head comparison. The table below is a head to head comparison of the key specs and features on the Astro Virtual 2 and the iNew V3. These new revelations put into question certain claims made by the Astro Founder and CEO, Munyaradzi Gwatidzo, during the Astro Virtual 2 launch. Astro has always maintained, and still does, that they design their own devices and the designs are proprietary. The Astro Virtual 2 is no exception they say. Gwatidzo claims that Astro spent 8 months “developing” the Astro Virtual 2 and he told me that the patents to that device are registered with about 6 patent bodies. So how could it be that a “replica” version of the Astro Virtual 2 surfaced before the original, which Astro claims to have rights to. Gwatidzo gave a meaningful explanation, but only failed to provide the evidence to back it up. He told me that their Chinese manufacturer could have sold their designs to rival brands without their consent. To be fair, this could be a possibility because Original Design Manufacturers (ODMs) have ridiculous minimum order quantities (MOQs) which Astro cannot meet so the manufacturer could have passed on the design to other brands so that they could satisfy their own MOQ requirements. The other side of the coin of this argument is that if Astro cannot meet the MOQs required by ODMs, they simply resort to buying Astro devices from Original Equipment Manufactures (OEMs) and have them branded Astro. I also spoke to Astro business manager Robert Chiwara and he echoed Gwatidzo’s version and also went further to say they are currently in a legal dispute situation with their Chinese manufacturer over a related incident, but could not elaborate further. We also tried to contact Shenzhen Chuangxinqi Communication co. LTD but the language barrier got in the way. However, there is also another piece of interesting information that we uncovered. Gwatidzo alleges that they started working on the Astro Virtual 2 designs in June 2013. On the other hand, iNew claims to have CE certified the iNEW in May 2013. CE certification means that a product has been assessed to meet European standards before being placed on that market. This may mean iNew already had the V3 way before the 17 May 2013 certificate issue date. 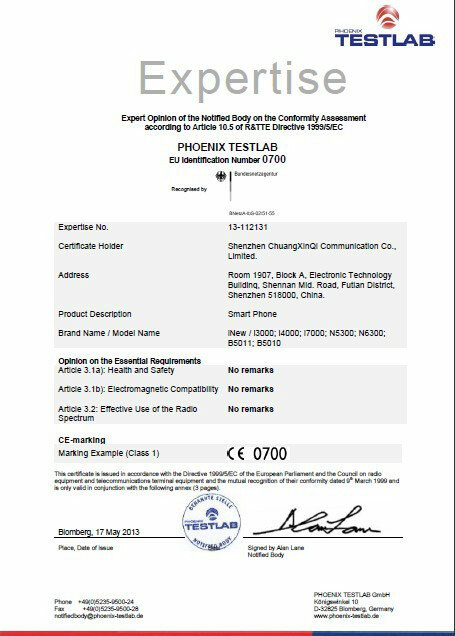 Scanned copy of Shenzhen ChuangXinQi Communication Co. Ltd CE certificate for the iNew V3 available here. However, it’s the Manufacturers themselves that “declare” the CE standards as his sole responsibility. Wikipedia says the process is a “self-certification scheme” and having the CE marking does not confirm that actual certification has been done. However, this blog seems to imply that the iNew V3 started surfacing at the Hong Kong Electronics Fair in 2012 putting into question whether or not Astro developed or designed the device as they claim. So as of now, we haven’t established the real owner on the Astro Virtual 2 or the iNew V3 but there is no doubt that the phones originated from the same design. Despite the mountain of evidence seemingly squashing Astro’s claims of ownership, it’s well documented that Chinese firms have no regard of patent laws and it could be that Astro is the victim here. However, we have equally had numerous false claims from local companies that claim to manufacture or design devices and own tech patents thereby deceiving the general public, government officials and most importantly, their customers. I personally hope Astro is not in this bracket. They have done well already, their software arm has the potential to disrupt the local tech ecosystem and I truly believe they are one of our strongest tech startups locally. However, we don’t need another Nhava scandal and the guys at Astro need to back up their story if they are to remain credible in the eyes of the public. This is like the pistorious case. We know what happened, but we just cant prove it. Who really believes that these guys designed the phones? I came head on with Astro lies one day. I bought an Astro device that had Android 4.2 written on the box but it had 2.3.6 version. Only when the Astro guys realised that I know my stuff offer me a refund. this is pathetic honestly. I applaud Astro for introducing the device to the Zim market and hope they export it as well. As for verifying patents, the process is easy and should not be subject that TechZim should be having problems with. Once a patent is lodged with a IP office, a unique number is issued and that number and the name of the patent becomes available to the public. Once all the steps are complited, then the patent description is also available to you and me. Actually it is in the interest of Astro to let the journalist know these details. SO maybe the article should indicate how they failed to extract what is almost available to the public from Astro. We have been down this road before….Nhava….. Ziva….Now Astra….. Branding and reselling does not make us inventors! Techzim is talking about inconsequential things, we need to support them!